Successfully Added 2DIN Car DVD Player - Universal Nissan, 6.95-Inch, Android OS, Quad-Core, CAN BUS, DVD Player, 20 Channel GPS to your Shopping Cart. 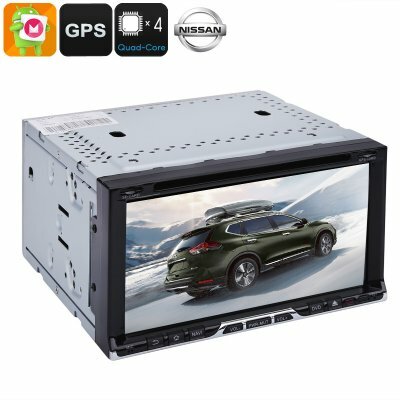 This universal 6.95-Inch 2DIN Android media player for Nissan cars provides you with a great way to pimp up your ride. Thanks to its Android operating system, this Dual-DIN DVD player brings along plenty entertainment possibilities. But that’s not all; it also features a highly accurate GPS navigation system to make sure you’ll never get lost again. Thanks to its Quad-Core processor, this car DVD player is capable of handling all basic software features available. Whether you use it to entertain your passengers, listen to music, or get GPS guidance – this car entertainment system is sure to meet your demands. It features a simple design that can be easily connected. This means that anybody can install this car DVD player without needing any technological knowledge. On its large 6.95-Inch display, this car entertainment system displays all media in 480p resolution. You’ll be able to insert external data through its SD card slot or USB stick. This allows you to carry films and series to entertain your passengers during upcoming road trips. Additionally, it comes with a DVD slot through which it lets you play traditional DVD discs. Your car DVD player furthermore supports WiFi. Thanks to this, you’ll be able to browse the web straight from your dashboard. No matter where you’re headed, with this Android media player, you’ll always stay connected. A highly-accurate 20 channel GPS system is in place to guide you through your upcoming holidays. From now on, you’ll never have to worry again about finding the right and fastest way to reach your destination. Running on Android maps, this navigation system is capable of guiding you anywhere in the world. It supports a detailed 3D interface which makes it easy for you to read your exact location. Thanks to its built-in porcelain antenna, you’ll be treated to accurate GPS readings anywhere on the globe. With 16GB of internal memory and a 64GB SD card slot, there is plenty of space to store all your maps, media, and more.